Weather permitting, work on the Asphalt Rejuvenation Project is scheduled to begin Monday, August 13, 2018. This work is part of the City’s ongoing street maintenance program, funded with the new sales tax recently approved for street improvements. Work will include the application of a rejuvenating agent to recently-paved streets to extend the life of the streets and to reduce the length of time they will require major maintenance in the future. A map of affected areas is included below..
Due to the nature of the work, changes to traffic patterns and traffic delays are expected. Traffic control will be in place to allow motorists to use all the streets in the area of construction, however, traffic will be slowed due to lane closures. Side streets will be temporarily closed, as the pavement operation moves through these intersections. Traffic is not expected to be kept from any street for more than eight to nine hours. 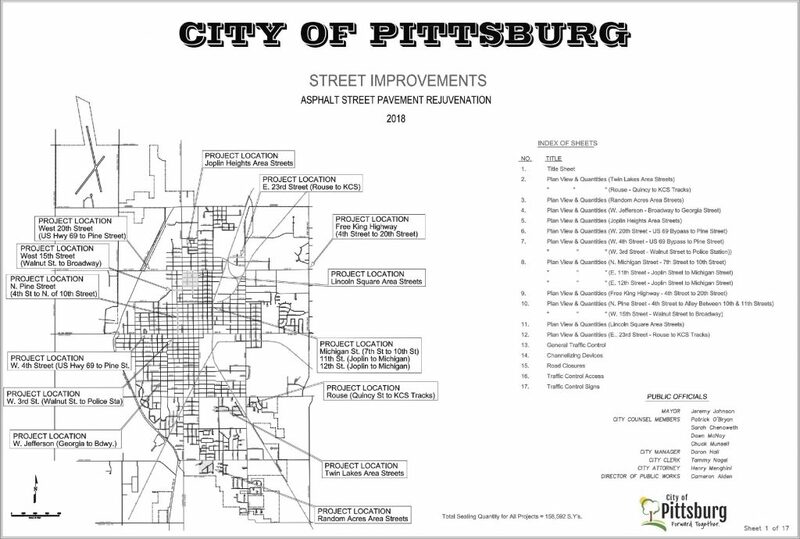 Typically, the streets will be opened one to two hours after application of the asphalt rejuvenator. Door hangers will be left at residences and businesses a day or two in advance of work in their area. All work is anticipated to be completed by October 1, 2018. Motorists are encouraged to seek alternate routes when possible, to use extreme caution when traveling in the area of construction, and be aware of workers in the work zone. The City of Pittsburg is requesting residents and businesses to prevent operating lawn sprinklers the night before or day of treatment to prevent damage to the pavement and possible liability. The City is also requesting that all children and pets be kept away from the street as the liquid asphalt will stick to shoes and tires and is difficult to remove.